The current concert season reveals various trends and cross-connections, including The current concert season reveals various trends and cross-connections, including a certain six degrees of the New Orleans Marsalis family royalty. Last fall, Wynton Marsalis brought his esteemed Lincoln Center Jazz Orchestra to the Granada on a triumphant tour premiering Spaces. Recently, New Orleans saxist Derek Douget, whose rÃ©sumÃ© includes playing with Marsalis patriarch Ellis and son Jason, played the Lobero following a weeklong educational county residency. 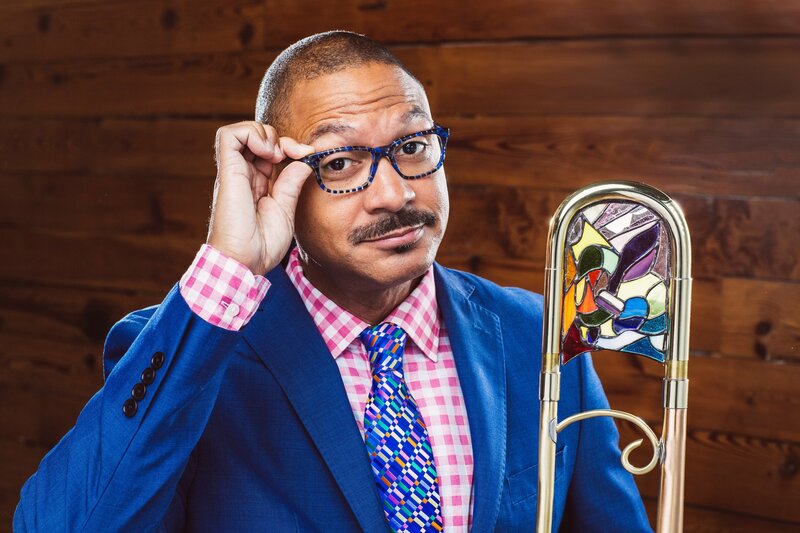 Next up is Delfeayo Marsalis, another of the musical Marsalis brothers â€” which include Branford, Wynton, and the aforementioned Jason â€” who makes his Santa Barbara debut Friday at the Lobero. The acclaimed trombonist/bandleader/educator/producerâ€™s Uptown Jazz Orchestra (UJO) takes serious (and joyous) account of the musical heritage of his birthplace, from its seminal jazz heritage circa the 1920s to the rougher-edged swagger of the cityâ€™s â€œstreetâ€ music and brass-band savvy. In a recent phone conversation, the Berklee College of Music grad talked up his 2008-formed UJO project, gaining musical momentum, and his higher public profile of late. Tell me about the background and current state of Uptown Jazz Orchestra. At a certain point, jazz was an entertainment music more so than what youâ€™d consider art music â€” although it had artistic merits. Now, itâ€™s following the path of the European concert music. Without going through the entire history, I guess youâ€™d say that [happened] after WWII, with bebop and the concentration on smaller groups and people like Charlie Parker. But you listen to Charlie Parker, and itâ€™s really celebratory. My impression is that, with Miles Davis and Bill Evans â€” which was probably the worst pairing for the sustenance of jazz â€” they created some wonderful music, but thatâ€™s when we run into the direction of the introvert. So, between the introversion of the musicians and the European concert tradition, itâ€™s difficult today. Weâ€™re coming from New Orleans, so weâ€™re bringing the real party. Was the agenda for the band from the get-go? How has it evolved? No, it was initially formed to play the classic big-band music correctly, with the proper feeling and groove. As time went on, Iâ€™d say probably six or seven years ago, I hosted a [local] TV show called Future Focus. I had three trombone players on â€” Corey Henry, Big Williams, and Trombone Shorty. I realized then that the difference between the New Orleans sound and the way I played was all about the interpretation of the rhythm. That next week, after Shorty was on the show, I started changing the sound of the band. We have a number of players who have come out of the street-band tradition, [so] we made that shift. When I first started playing the street music, the guys in the band said, â€œWe canâ€™t really play that and [then] shift gears and try to play more of the swing songs.â€ The model of the band now is that we can play any music, from any decade, with conviction and authority. If you come to one of our shows, the goal is that weâ€™re going to hit you with everything from the 1920s up to today. I caught your brother Jasonâ€™s band at Snug Harbor in New Orleans, with his 21st Century Trad Band project. It strikes me that you two are working at a similar musical goal from different angles. Is that true? Yeah. Well, all of my brothers have borrowed from me over the years. [Laughs.] I embrace it, man. I give it freely. Itâ€™s fine. The funny thing about being a younger brother is that I can have an argument with Branford or Wynton, and they would 100 percent disagree with me. Then I would read an interview that they had in a magazine, and theyâ€™re taking my side, like they came up with it. But itâ€™s cool. Itâ€™s all in fun. If you have brothers, you know thatâ€™s what it is. Itâ€™s interesting that the four musical brothers gravitated toward different instruments. Was that just by happenstance or by design? Oddly enough, thereâ€™s a photo of Branford and Wynton when theyâ€™re 2 and 3 years old. I guess they were going to the circus or something, but Branford is holding a saxophone and Wynton is holding something like a kazoo trumpet. It appears to me that the instruments chose us. If the saxophone and the trumpet are arguing, the trombone comes along and says, â€œHey, man, everythingâ€™s going to be cool.â€ And if theyâ€™re getting along too much, then the trombone has to kind of stir the pot and say, â€œHold on; it ainâ€™t that cool.â€ The trombonist has to be the most flexible in the New Orleans jazz band. I would say that suits my personality, inside of the family. And Jason, of course, being the youngest, the youngest generally plays drums. Drums is the easiest to get into. You can start beating on the table, with pots and pans. Thatâ€™s how it seems that the instruments kind of choose you, and weâ€™re perfectly suited for the instruments we play. Youâ€™re describing the trombonistâ€™s role as the peacemaker, and also a trouble maker when necessary. And that also described the role of the producer, a hat you have donned many a time. Yes, itâ€™s all the same mind-set, and Iâ€™ve worked in musical theater with kids; Iâ€™ve produced shows and plays. Itâ€™s a very similar mind-set. In Uptown Jazz, we have more personalities. I donâ€™t know of any jazz orchestra that has as many different, unique personalities as we have. I have to feature everyone and figure out the best way to showcase each individual and their talents. Itâ€™s monumental, but thereâ€™s nothing like this band. It seems that this band is on the verge of bursting onto a new level, or a new chapter in its life. Is that the case? Oh yes, certainly. We just have a few things. The drum chair is difficult, finding someone who knows the New Orleansâ€“style drumming and the sophisticated, more modern type of sound. I have the greatest respect for the brothers playing out in the street bands. They play with so much passion and honesty. The task for us is really monumental â€” to effectively play almost anything from any generation. When weâ€™re playing our concerts now, weâ€™re just thinking, where would we like our audience to be emotionally? Where do we want to begin and where do we end? And then to have the repertoire to connect with whatever weâ€™re feeling at any point â€” thatâ€™s our goal. Delfeayo Marsalis and the Uptown Jazz Orchestra play Friday, April 5, 8 p.m., at the Lobero Theatre (33 E. Canon Perdido St.). Call (805) 963-0761 or see lobero.org.